Forex Forum → Forex Strategy Builder Professional → Optimizer issue, how work? Topic: Optimizer issue, how work? 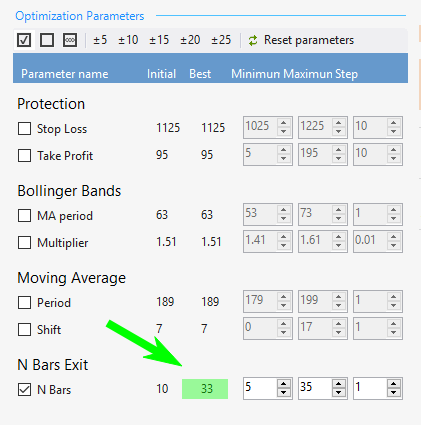 in the video I show a test strategy, with different number in the "N bars" give diferent win/loss ratio, the best result is 20, ok. so I proceed to leve the number at 10, and do a optimizer from 1 to 35 with step of 1, and "search best" win/loss ratio. and nothing hapen, so I dont undestand how work this. Re: Optimizer issue, how work? The strategy may not fulfill the Acceptance Criteria and that to prevent the Optimizer to validate it. 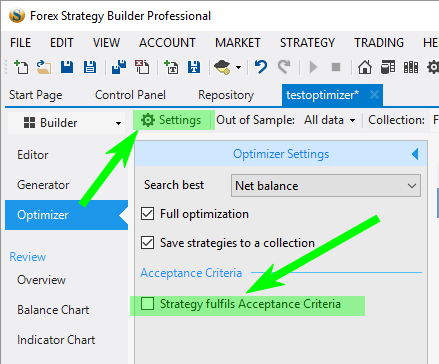 So I removed the "Strategy fulfills the acceptance criteria' from the "Settings" button of the Optimizer. Thanks, yes I have the same setup, but after testing several time in a VM and another computers, to replicated this issue, I notice that if the strategy was generated with the Generator using EURUSD 5M (this is the case with this strategy), the optimizer will work only with EURUSD and TF 5M, also work with USDJPY TF 5M, but NOT working with GBPUSD, USDCHF, EURGBP, I dont test the anothers pairs. but is strange. maybe you will have the explanation for this behaviour. pd. you can test with the FSB Demo Data to replicated.